One could argue that exempting ObamaCare from the PAYGO requirement is appropriate given the defects in current budget rules. By law, the CBO must follow certain rules when doing cost estimates of legislation and projecting federal spending under current law. Under those rules, CBO projects ObamaCare will reduce the deficit. No question. But Congress often defeats those budget rules by passing legislation with “pay fors” (i.e., spending cuts) that make the budget look better, yet are highly unlikely to be sustained because they are politically implausible. A good example of this is the “sustainable growth rate” formula, where Congress promises to ratchet down the government price controls that Medicare uses to pay physicians in future years. Congress has consistently reneged when those cuts come due. The pretense of future cuts that Congress writes into law makes 10-year budget projections/deficits look better than actual, unwritten policy would suggest. ObamaCare opponents submit that this law is one of those instances where law and policy are at variance. So even though ObamaCare will reduce the deficit under existing budget rules, the spending cuts (actually, reductions in future spending growth) in the law were never going to take effect anyway. The CBO, CMS, and even the IMF have all discredited the idea that ObamaCare would reduce the deficit, because they all question the sustainability of ObamaCare’s spending “cuts.” Exempting ObamaCare repeal from PAYGO rules is appropriate if those rules have failed to protect taxpayers. The news is going from bad to worse for Ireland. The Irish Independent is reporting that the Swiss Central Bank no longer will accept Irish government bonds as collateral. The story also notes that one of the world’s largest bond firms, PIMCO, is no longer purchasing debt issued by the Irish government. And this is happening even though (or perhaps because?) Ireland received a big bailout from the European Union and the International Monetary Fund (and the IMF’s involvement means American taxpayers are picking up part of the tab). I’ve already commented on Ireland’s woes, and opined about similar problems afflicting the rest of Europe, but the continuing deterioration of the Emerald Isle deserves further analysis so that American policy makers hopefully grasp the right lessons. Here are five things we should learn from the mess in Ireland. 1. Bailouts Don’t Work – When Ireland’s government rescued depositors by bailing out the nation’s three big banks, they made a big mistake by also bailing out creditors such as bondholders. This dramatically increased the cost of the bank bailout and exacerbated moral hazard since investors are more willing to make inefficient and risky choices if they think governments will cover their losses. And because it required the government to incur a lot of additional debt, it also had the effect of destabilizing the nation’s finances, which then resulted in a second mistake – the bailout of Ireland by the European Union and IMF (a classic case of Mitchell’s Law, which occurs when one bad government policy leads to another bad government policy). American policy makers already have implemented one of the two mistakes mentioned above. The TARP bailout went way beyond protecting depositors and instead gave unnecessary handouts to wealthy and sophisticated companies, executives, and investors. But something good may happen if we learn from the second mistake. Greedy politicians from states such as California and Illinois would welcome a bailout from Uncle Sam, but this would be just as misguided as the EU/IMF bailout of Ireland. The Obama Administration already provided an indirect short-run bailout as part of the so-called stimulus legislation, and this encouraged states to dig themselves deeper in a fiscal hole. Uncle Sam shouldn’t be subsidizing bad policy at the state level, and the mess in Europe is a powerful argument that this counter-productive approach should be stopped as soon as possible. By the way, it’s worth noting that politicians and international bureaucracies behave as if government defaults would have catastrophic consequences, but Kevin Hassett of the American Enterprise Institute explains that there have been more than 200 sovereign defaults in the past 200 years and we somehow avoided Armageddon. 2. Excessive Government Spending Is a Path to Fiscal Ruin – The bailout of the banks obviously played a big role in causing Ireland’s fiscal collapse, but the government probably could have weathered that storm if politicians in Dublin hadn’t engaged in a 20-year spending spree. 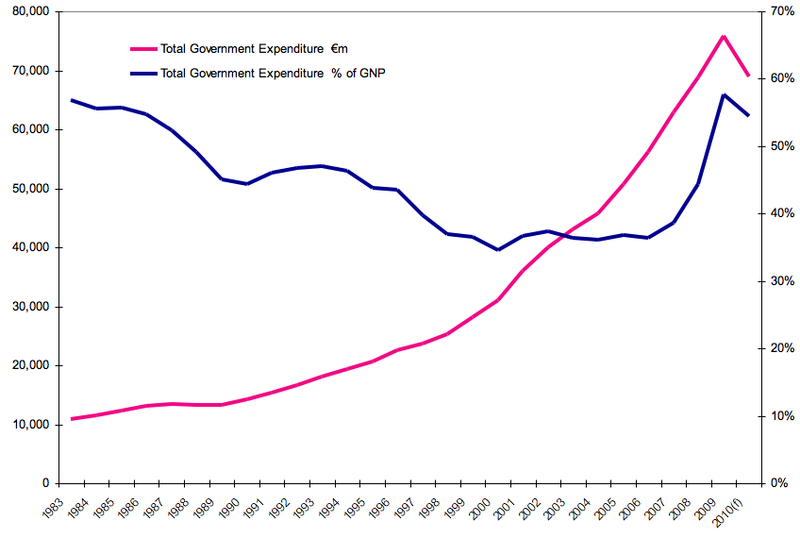 The red line in the chart shows the explosive growth of government spending. Irish politicians got away with this behavior for a long time. Indeed, government spending as a share of GDP (the blue line) actually fell during the 1990s because the private sector was growing even faster than the public sector. This bit of good news (at least relatively speaking) stopped about 10 years ago. Politicians began to increase government spending at roughly the same rate as the private sector was expanding. While this was misguided, tax revenues were booming (in part because of genuine growth and in part because of the bubble) and it seemed like bigger government was a free lunch. Eventually, however, the house of cards collapsed. Revenues dried up and the banks failed, but because the politicians had spent so much during the good times, there was no reserve during the bad times. American politicians are repeating these mistakes. Spending has skyrocketed during the Bush-Obama year. We also had our version of a financial system bailout, though fortunately not as large as Ireland’s when measured as a share of economic output, so our crisis is likely to occur when the baby boom generation has retired and the time comes to make good on the empty promises to fund Social Security, Medicare, and Medicaid. 3. Low Corporate Tax Rates Are Good, but They Don’t Guarantee Economic Success if other Policies Are Bad – Ireland used to be a success story. They went from being the “Sick Man of Europe” in the early 1980s to being the “Celtic Tiger” earlier this century in large part because policy makers dramatically reformed fiscal policy. Government spending was capped in the late 1980 and tax rates were reduced during the 1990s. The reform of the corporate income tax was especially dramatic. Irish lawmakers reduced the tax rate from 50 percent all the way down to 12.5 percent. This policy was enormously successful in attracting new investment, and Ireland’s government actually wound up collecting more corporate tax revenue at the lower rate. This was remarkable since it is only in very rare cases that the Laffer Curve means a tax cut generates more revenue for government (in the vast majority of cases, the Laffer Curve simply means that changes in taxable income will have revenue effects that offset only a portion of the revenue effects caused by the change in tax rates). Unfortunately, good corporate tax policy does not guarantee good economic performance if the government is making a lot of mistakes in other areas. This is an apt description of what happened to Ireland. The silver lining to this sad story is that Irish politicians have resisted pressure from France and Germany and are keeping the corporate tax rate at 12.5 percent. The lesson for American policy makers, of course, is that low corporate tax rates are a very good idea, but don’t assume they protect the economy from other policy mistakes. 4. Artificially Low Interest Rates Encourage Bubbles – No discussion of Ireland’s economic problems would be complete without looking at the decision to join the common European currency. Adopting the euro had some advantages, such as not having to worry about changing money when traveling to many other European nations. But being part of Europe’s monetary union also meant that Ireland did not have flexible interest rates. Normally, an economic boom drives up interest rates because the plethora of profitable opportunities leads investors demand more credit. But Ireland’s interest rates, for all intents and purposes, were governed by what was happening elsewhere in Europe, where growth was generally anemic. The resulting artificially low interest rates in Ireland helped cause a bubble, much as artificially low interest rates in America last decade led to a bubble. But if America already had a bubble, what lesson can we learn from Ireland? The simple answer is that we should learn to avoid making the same mistake over and over again. Easy money is a recipe for inflation and/or bubbles. Simply stated, excess money has to go someplace and the long-run results are never pleasant. Yet Ben Bernanke and the Federal Reserve have launched QE2, a policy explicitly designed to lower interest rates in hopes of artificially juicing the economy. 5. Housing Subsidies Reduce Prosperity – Last but not least, Ireland’s bubble was worsened in part because politicians created an extensive system of preferences that tilted the playing field in the direction of real estate. The combination of these subsidies and the artificially low interest rates caused widespread malinvestment and Ireland is paying the price today. Since we just endured a financial crisis caused in large part by a corrupt system of housing subsidies for Fannie Mae and Freddie Mac, American policy makers should have learned this lesson already. But as Thomas Sowell sagely observes, politicians are still fixated on somehow re-inflating the housing bubble. The lesson they should have learned is that markets should determine value, not politics. The article also is flawed in assuming that harsher enforcement is the key to compliance. As this video shows, even the economists at the Paris-based Organization for Economic Cooperation and Development admit that tax evasion is driven by high tax rates (which is remarkable since the OECD is the international bureaucracy pushing for global tax rules to undermine tax competition and reduce fiscal sovereignty). European and International Monetary Fund officials on Wednesday were considering a dramatically increased $158 billion bailout package for Greece as the country’s debt crisis continued to ripple across Europe, with Standard & Poor’s downgrading the credit rating on Spain, the continent’s fourth-largest economy. …In Europe, the most intense focus remains on Greece, but fears were intensifying elsewhere, especially in Portugal and Spain. Though analysts noted that both countries are in better shape than Greece – with lower ratios of debt – they both shared large fiscal deficits and poor long-term economic prospects. On Wednesday, the government in Portugal announced that it would move up a program of painful spending cuts to shrink its budget deficit and shore up confidence amid signs that fearful depositors were moving capital out of Lisbon banks. After lowering Greek debt to junk bond status on Tuesday, Standard & Poor’s kept Spain at investment grade status, but lowered its rating one notch, to AA. Mr. Strauss-Kahn said there was broad agreement on the need for consensus and coordination in the reform of the global financial sector. “Even if they don’t follow exactly the same rule, they have to follow rules which will not be in conflict,” he said. He said there were still major differences of opinion on how to proceed, saying that countries whose banking systems didn’t need taxpayer bailouts weren’t willing to impose extra taxation on their banks now, to create a cushion against further financial shocks. …Mr. Strauss-Kahn said the overriding goal was to prevent “regulatory arbitrage”—the migration of banks to places where the burden of tax and regulation is lightest. He said countries with tighter regulation of banks might be able to justify not imposing new taxes. I’ve been annoyingly repetitious on the importance of making governments compete with each other, largely because the evidence showing that jurisdictional rivalry is a very effective force for good policy around the world. I’ve done videos showing the benefits of tax competition, videos making the economic and moral case for tax havens, and videos exposing the myths and demagoguery of those who want to undermine tax competition. I’ve traveled around the world to fight the international bureaucracies, and even been threatened with arrest for helping low-tax nations resist being bullied by high-tax nations. Simply stated, we need jurisdictional competition so that politicians know that taxpayers can escape fiscal oppression. In the absence of external competition, politicians are like fiscal alcoholics who are unable to resist the temptation to over-tax and over-spend. This is why the IMF’s new scheme should be rejected. It is not the job of international bureaucracies to interfere with the sovereign right of nations to determine their own tax and regulatory policies. If France and Germany want to adopt statist policies, they should have that right. Heck, Obama wants America to make similar mistakes. But Hong Kong, Switzerland, the Cayman Islands, and other market-oriented jurisdictions should not be coerced into adopting the same misguided policies. Did the IMF Deliberately Exaggerate the 2008 Financial Crisis? If true, these claims raise troubling questions about the incentives behind the largest increase of resources in the Fund’s history.